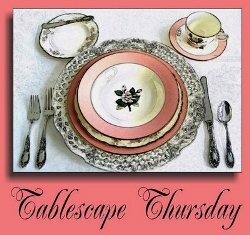 Welcome to the 425th Tablescape Thursday! Thanksgiving is just two weeks away! This month is flying by, but then the holidays always do. 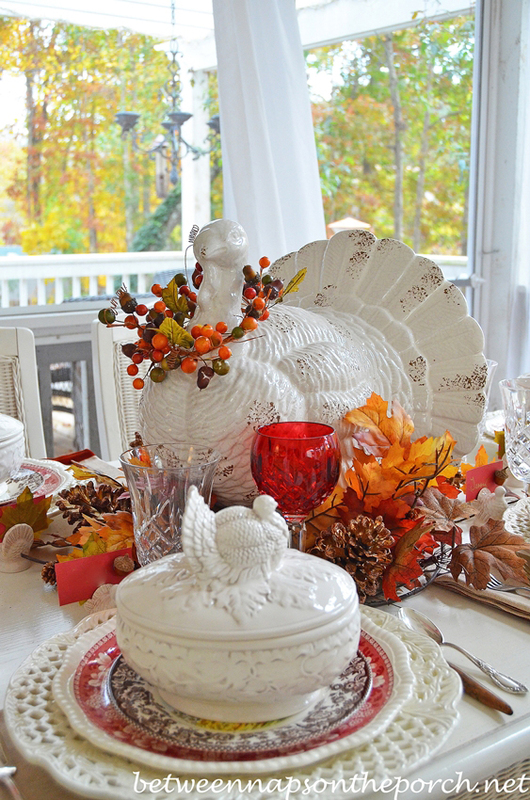 For this week’s Tablescape Thursday, I’m sharing seven past Thanksgiving table settings. Hope they will provide a bit of inspiration for your Thanksgiving this year. Will you be cooking this year or traveling to be with family? 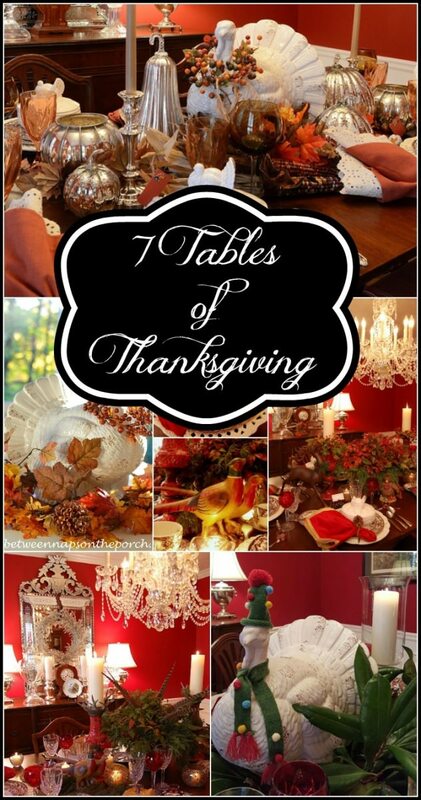 Click on any title or picture below to open that particular Thanksgiving Tablescape post. 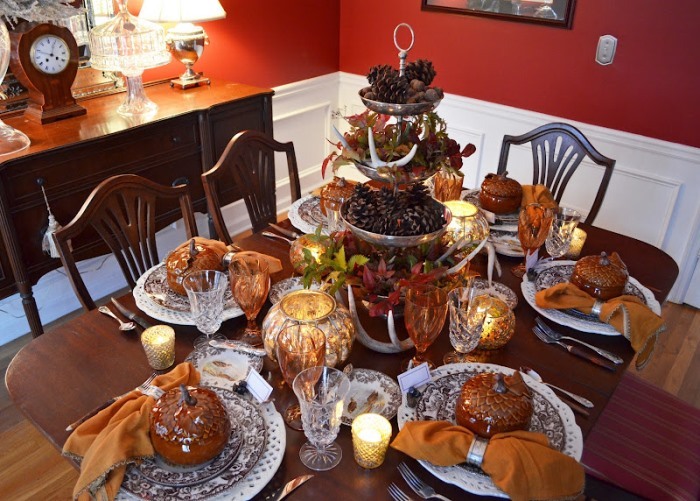 Thanks for the round-up of your beautiful Thanksgiving tables Susan! I especially love seeing the pretty foliage in the background behind your handsome Tom centerpiece on the table on your porch! All of these tables are gorgeous! You always inspire me. Thank you for hosting. Nice to see all of these tables together! 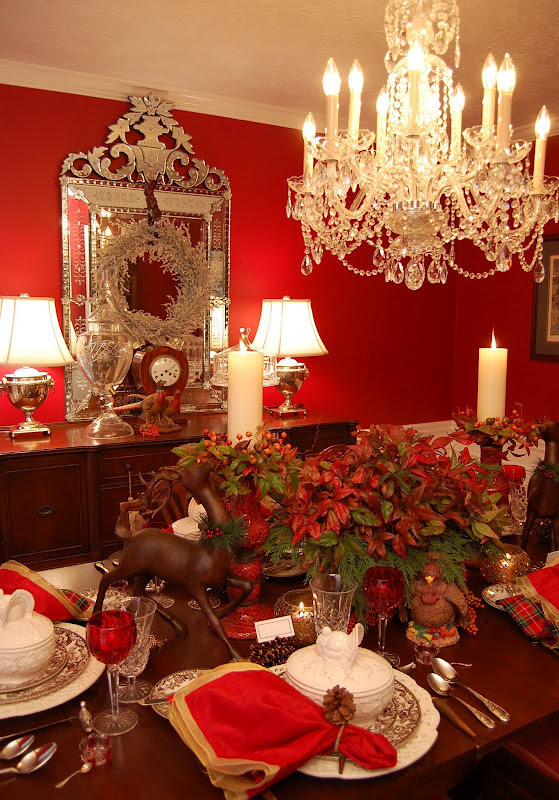 They offer so many festive ideas and places to look…wow. Susan, thanks for hosting each week. You and i seem to have the same taste in dishes….i use spode with my collection of woodland salad plates, deer, bunny, pheasant, beer, ect with my orange pumpkin dessert plates and soup bowls with my fitz and floyd pheasant centerpiece and tray, spode mugs and grapevine goblets, fall plaid orange and green and gold placemaps and tapestry fruit runner, lead glass candlestick holders with carmel colored embossed 3in candles. 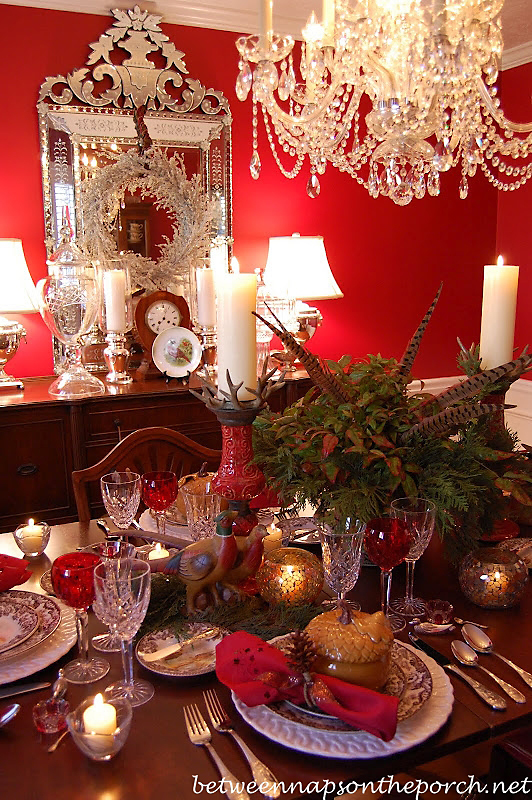 We will not have guests but even with just the two of us it feels festive and pretty. I leave it set during the entire season. I smile whenever i see it. It feels like we are expecting guests. 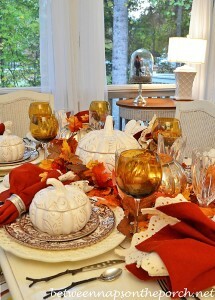 Goodness, what beautiful tablescapes! Thanks for hosting and for all of this inspiration! I just love your big fat white turkey Susan! I’m not hosting this year, we will be going to my nephew’s, and they will be dealing with the chaos- I feel like I’m on vacation! Thanks for the party today and sharing your past creations again, always fabulous! 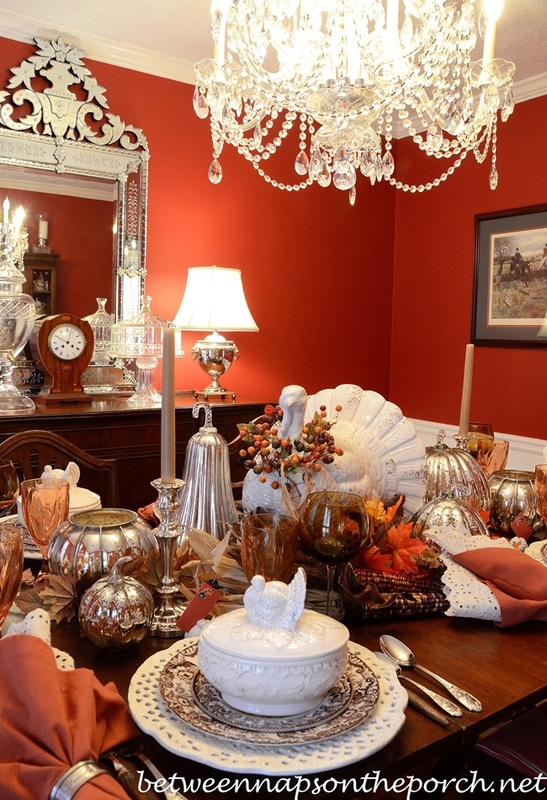 Susan, your Thanksgiving tables are so elegant and festive! Love seeing each year. Have a great weekend. Thanks so much, Michael! Enjoying your IG and all those gorgeous sunsets and antiquing finds! I’ve always enjoyed every tablescape you’ve created. You were my biggest inspiration to try tablescaping! 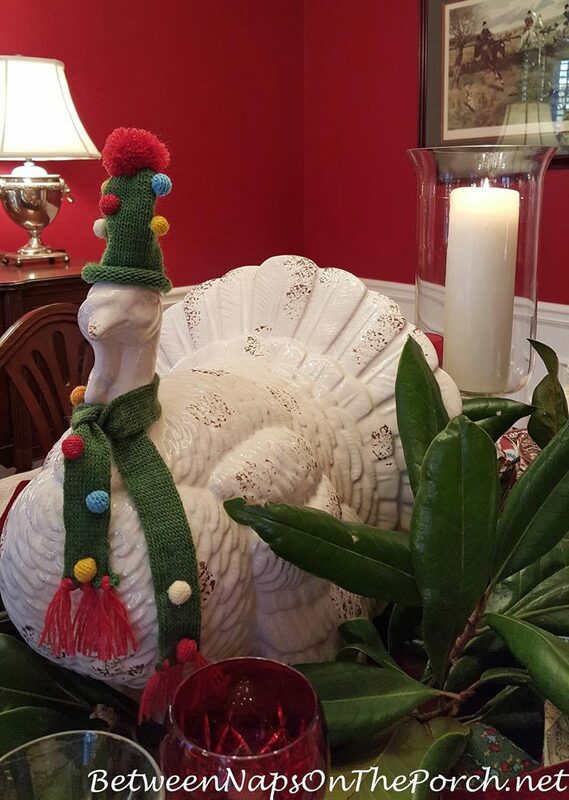 Love Mr. turkey with the hat and scarf- too cute. Thanks so much, Liz! Appreciate you and all the inspiration you’ve given me over the years of tablescaping! 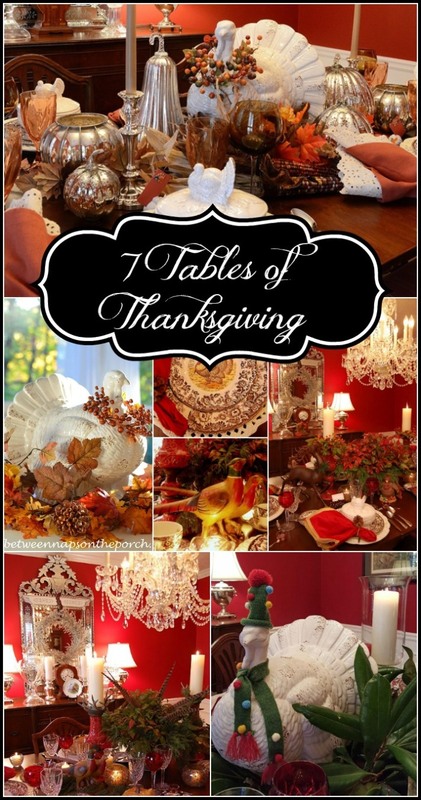 What a wonderful collection of beautiful Thanksgiving tables! Your tables are always beautiful. I will post my Thanksgiving table next week. I just got it set and photographed:) I linked our latest everday table today. Thanks so much for hosting!!! Even with using items multiple times, they are all distinct and different. 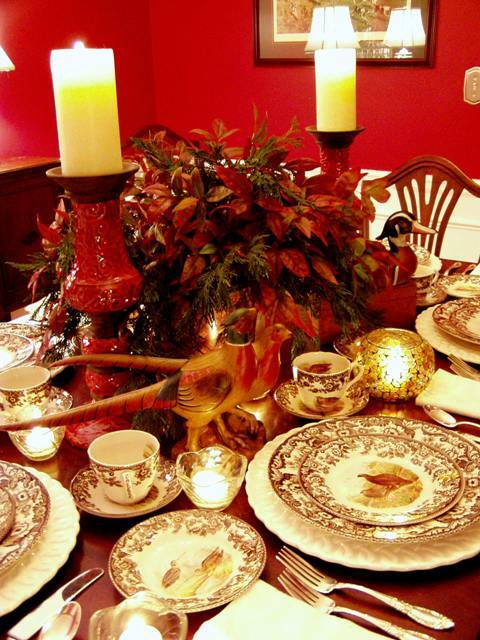 And each tablescape is timeless. Gotta love that big turkey guy! Thanks, Mia! I love that silly turkey, too. I didn’t get him the first year Pottery Barn made him available, even when he was on sale! He sold out quickly and I regretted passing him up. I purchased him right away when they brought him back the following year. I always love your tablescapes! Just like every year, I am hosting Thanksgiving dinner. Thankfully, my mother, my sister and I share in cooking the meal. It’s my favorite holiday, but it is very exhausting. Sandra, that sounds wonderful, getting to spend it with those you love! I know it’s exhausting but so worth it in the end…the memories you’re making. Your tables are always lovely Susan and thanks for inviting us here each week. Thanks so much, Janice! That’s a great idea, doing a practice run. You’ll know right away if there’s something missing that you need to get before the big day. Love that idea! Thank you for the lovely recap–never tire of seeing a good thing. I, too, can’t believe how fast time flies when the holidays are upon us. I thought I was ahead of the game for purchasing hostess gifts and Xmas gifts, and now it seems I have so much to finish up. We will be dining with my cousin this year. They live only six minutes from us, so it’s an easy trip to bring over Thanksgiving yummies. There’s always a big crowd, so lots of laughter. I hope your T. Day is a wonderful one. Susan, I tried to reply to your e-mail about the floor finish but it came back to me stating your box was full. I will take your advice about refinishing in the warmer months. I like the satin finish best, too.Thanks so much for helping out. I do appreciate that so much. Hugs! Yeah, I checked with my hosting company and they cleared out my Inbox for me. All the emails forward to my gmail box, so I do get them thankfully. You shouldn’t get that message anymore, they set the Inbox to unlimited. Can’t wait to hear how those floors turn out. I think hardwood floors transform a home more than just about anything. I remember first seeing your tablescape from 2009 with the little duck knife rests and I went nuts because I just HAD TO HAVE THEM!! I found them on the Godinger website and ordered them, used them the following year on my Thanksgiving table. That’s what you do to us, you inspire by creating beautiful and original tables with items that can be found (with a little luck and hunting skills) and recreated on our own tablescapes!! Thank you for the memories! 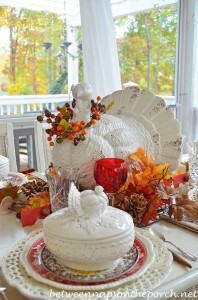 Love your tables…and especially that big fat white turkey! I want one, ha. Thanks, Sheila! Mr. Turkey came from Pottery Barn…they had two years in a row. They need to bring him back again! You may find one on eBay, I saw one on there a few years back. Thank you for the inspiration and the Tksgiving table ideas, dear Susan. What lovely tables of Thanksgiving. I can not decide which is my favorite. They all are so beautiful. Thanks for sharing. No one does it better than you, Susan! You’re an amazing, inspirational, multi-talented woman. Happy holidays and good health to you. 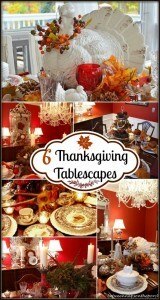 Thank you Susan for all the Thanksgiving tablescapes together! So beautiful and inspirational. We are going with a large group of friends to a Brazilian steakhouse, go figure! 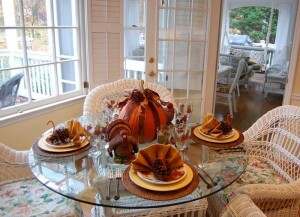 I will cook an early thanksgiving dinner for hubby and I. What’s the holiday without turkey, dressing and pumpkin pie?! Best post of the TS parties, I ever seen giving us the throwback. Love all your lovelies. P.S. : Canadians celebrated theirs, on Oct. 10th.